The Montreal Canadiens have been one of the most intriguing teams in the league recently—in the way it’s hard to look away from a car crash—with a very public dispute surrounding the future of captain Max Pacioretty. With reports surfacing about previous trade requests, and Pacioretty’s agent using Twitter to issue strong denials, the entire hockey world is waiting to see whether the team will reach an extension with their talented winger or trade him to a contender for the upcoming season, his last under contract. Eric Engels of Sportsnet held an impromptu Q&A on Twitter this morning, answering fan questions about the state of the Canadiens. When asked about a potential extension with Pacioretty, he didn’t mince words, saying “unless it is a sign and trade, I don’t see there being any possibility of a long-term extension” and explaining that Mike Hoffman and Jeff Skinner are obvious comparables when it comes to recent trades. With training camps set to open in less than two weeks, the Canadiens don’t have much offseason left to make a move if Pacioretty is truly on his way out. Andrew Peeke was drafted 34th overall in 2016 by the Columbus Blue Jackets, but decided to go the collegiate route for his hockey development. After two years at Notre Dame that decision has been rewarded, as Peeke was named captain today by the legendary program. The school brought in alums like Anders Lee, Cal Petersen, Steven Fogarty and Erik Condra to announce the decision in a video. Peeke, a 20-year old defenseman has followed an excellent development path and could be a two-way difference maker when he finally transitions to the professional ranks. Sportsnet released the “best of the rest” for their recent Top 100 rankings, which includes forwards Jaden Schwartz, Sebastian Aho and Dylan Larkin, defensemen Mattias Ekholm and Torey Krug, and goaltender Antti Raanta. There is plenty of talent still left off the ranking, but Detroit Red Wings fans will be happy to see at least one of their players recognized in some fashion. They were the only team with no one on the original ranking, though apparently Filip Zadina did receive some votes despite not yet making his NHL debut. The Vegas Golden Knights already surprised a few when they reached out and stole Paul Stastny away from Western Conference rival Winnipeg. However, the Golden Knights are apparently not done as The Athletic’s Pierre LeBrun reports that Vegas is the front-runner for unrestricted free agent defenseman Nick Holden. Holden, who spent time with both the New York Rangers and Boston Bruins last season, would be a solid depth defenseman that could add to Vegas’ core. he averaged 19:00 ATOI between both clubs, but only posted four goals and 17 points on the year. However, the 31-year-old may be starting to show a decline in skills as he was a 34-point player in 2016-17 with the Rangers. Incidentally, Holden is being pursued by two teams as the Boston Bruins are also vying for the blueliner’s services, according to Sportsnet’s Mark Spector. The Bruins, after all, gave up a third-round pick and low-end prospect Rob O’Gara at the deadline. LeBrun also mentions that while Nashville Predators defenseman Ryan Ellis, who will be a unrestricted free agent in one year, can sign an extension as of today. However, the scribe writes that Nashville isn’t there yet. They intend to reignite talks with Ellis and his representatives within the next one to two weeks. Nashville wants to keep Ellis in the fold at all costs as the team has put major emphasis on having a dominant four defense. The team already has P.K. Subban ($9MM AAV) and Mattias Ekholm ($3.75MM AAV) locked up for four years, while Roman Josi ($4MM AAV) is signed for another two years. The New York Rangers can breathe easier after the agent for restricted free agent Vladislav Namestnikov, Dan Milstein, refuted rumors that the forward was leaving for the KHL. Namestnikov, who was acquired from Tampa Bay at the trade deadline, but saw his playing time drop once he arrived in New York. After averaging 17:30 of ATOI as a Lightning, his playing time dropped to 15:43, along with his offensive production. After potting 20 goals with Tampa Bay, he managed just four points in 19 games with the Rangers. However, Milstein insists the rumors are not true and that Namestnikov believes playing in the NHL is a privilege and honor and an extension is in the works with the New York Rangers. Mike Harrington of The Buffalo News reports the Buffalo Sabres are currently working on re-signing winger Scott Wilson. The 26-year-old was picked up in a December trade this last season from the Detroit Red Wings and played a regular role as a bottom-six forward. After not scoring a point in 17 games with Detroit, he tallied six goals and 14 points in 49 games in Buffalo. 8:05pm: Roman Josi and Kevin Fiala will both also be journeying to Denmark to play for Switzerland, raising the total to seven Predators who will be in the tournament. The huge contingent of players just reiterates how talented the Nashville roster is, especially with others likely turning down offers. 4:15pm: After facing elimination at the hands of the Winnipeg Jets last night, several Nashville Predators players will be heading to the IIHF World Hockey Championship. We learned earlier today that Eeli Tolvanen would continue his whirlwind season with Team Finland, while Nick Bonino will join Team USA. Chris Johnston of Sportsnet also reports that Viktor Arvidsson, Mattias Ekholm and Filip Forsberg will all join Sweden. All four new additions will be huge for their respective countries, as the tournament heads towards the elimination rounds next week. Bonino hasn’t represented the USA at the tournament since 2015 when he was still with the Vancouver Canucks. That year, he registered four points in 10 games en route to a bronze medal. He’ll join a team that just crushed Korea 13-1 to win their fifth-straight game to open the tournament. That’s a feat the team hasn’t accomplished since 1933, and one that bodes well for their chances in the medal round. Ekholm and Forsberg have both appeared in the tournament on multiple occasions, but this will be Arvidsson’s first time around. The 25-year old winger last represented Sweden at a major international tournament in 2013, when he helped their World Junior squad to a silver medal. All three should increase Sweden’s odds of a medal tremendously, as three All-Star level talents from the NHL. As the holiday season approaches, PHR will look at what teams are thankful for as the season nears the quarter point of completion. There also might be a few things your team would like down the road. We take a look at what’s gone well in the first month and what could improve as the season rolls on. So far we’ve covered ANA, ARZ, BUF, CGY, CAR, CBJ, COL, DET, LAK, NYI, STL, TOR, WSH, and VGK. Who are the Nashville Predators most thankful for? Not only did Poile orchestrate trades for P.K. Subban and Ryan Johansen that resulted in a Stanley Cup Finals berth in their first full season with the team, but he has repeatedly locked up assets for reasonable contracts and once again used his trading skills to bring in a key player. Over the past two summers, the Predators had several high profile restricted free agents to sign. Johansen, Filip Forsberg, and Viktor Arvidsson were all without deals but are now locked in for at least five seasons together. Poile was able to sign the trio to a combined $18.25MM cap hit because of previous deals he’d struck, most notably with Ryan Ellis, Roman Josi and Mattias Ekholm. That group is currently earning only a combined $10.25MM, despite each being regarded as potential top-pairing options. He’s done it again this season, by bringing in Kyle Turris and immediately extending the center for another six seasons without any signing bonuses or trade protection. Turris has played just nine games since coming over from the Ottawa Senators but has fit in perfectly, recording seven points already. Poile has never been one to shy away from long contracts or big trades, and it’s paying off again in the standings this year. 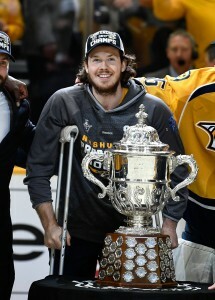 The end of last year’s playoffs must have been hard to watch for the Predators front office, as Johansen, Kevin Fiala and others went down to freak injuries just as they were approaching the Finals. 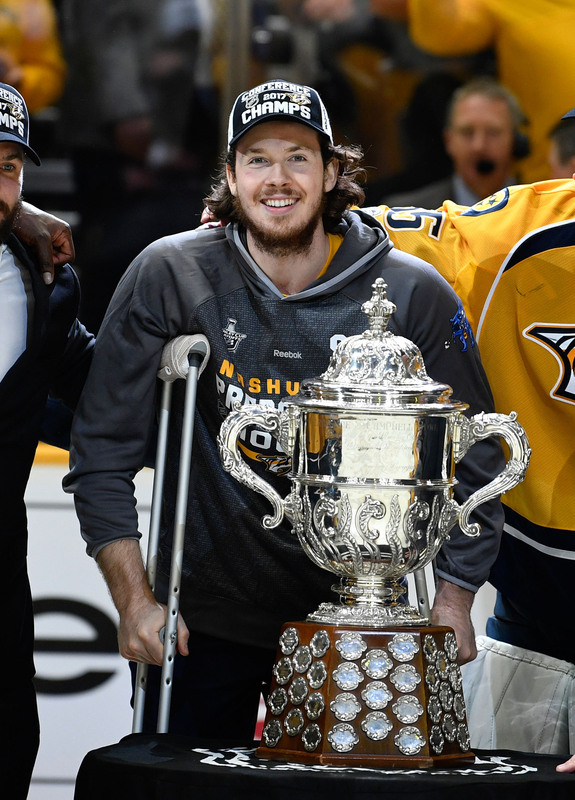 That injury luck carried into the summer, when doctors told the Predators in September that Ellis could need another six months to rehab his surgically repaired knee. He’d hurt it in those Stanley Cup Finals, but played through pain in Game 6 anyway. Ellis joined teammates on the ice today for their morning skate, the first time he’d attended a team practice since the surgery according to Adam Vingan of The Tennessean. While it isn’t at all a signal that he’s set to return early, just the fact that he’s “on track” is good news for Predators fans. A return from the 26-year old will be a huge addition for the team, as he is as important as any other defender to the club when fully healthy. Someone slowing down the St. Louis Blues and Winnipeg Jets. No matter how well the Predators play, they still are in a division with two teams that look equally dangerous. The Blues and Jets have played just about as well as you could this season, and both sit above Nashville in the standings (not to mention the Dallas Stars and Chicago Blackhawks looming in the shadows). All three teams have some similarities, but the Predators will hope that their experience from last season will take them to the next level this year. Winnipeg is especially green, but loaded with young talent throughout their roster. With a goaltender who is finally stopping the pucks on a regular basis, they look primed to wrench open their window of success a little early. St. Louis has been arguably the best team in the NHL right from the start, armed with an incredibly deep forward group and a Norris candidate defenseman. Even with some struggles from Jake Allen recently, the team keeps winning and could be unstoppable if he can find his form once again. The 27-year old goaltender struggled early on last year as well, before going on a Vezina-caliber run through the second half and early playoffs. St. Louis doesn’t look like they’re going away anytime soon. What should be on the Predators Holiday Wish List? Despite locking up their core long-term this summer, the Predators actually have a bit of cap space to play with as they head into the months leading up to the trade deadline. Though young forward Fiala has been solid on the powerplay and Turris has added another dimension down the middle, they still rely too heavily on their top three to handle the scoring load. One more forward capable of playing somewhere in the middle-six could push them over the edge. After already dealing Samuel Girard, Vladislav Kamenev and a second-round pick to obtain Turris, it’s not clear if Poile wants to sacrifice more future assets for help this season. But if a big, scoring winger were to shake loose at the deadline, they’d surely have to take a look. Daniel Sedin has a chance to take the spotlight again for the Vancouver Canucks. At age 37, neither Sedin nor his brother, Henrik Sedin, are the focal points of the team anymore. However, after Daniel Sedin picked up a goal and an assist in Friday’s game against the New Jersey Devils, he now just needs two points to join his brother as the 87th NHL player to reach 1,000 points. His next opportunity will be Sunday against the New York Rangers, according to Ben Kuzma of The Province. Henrik Sedin already accomplished the feat last season and currently boasts 1,032 points. Adam Vingan of the Tennessean hands out first quarter grades for the Nashville Predators, handing out excellent grades to Filip Forsberg and the Predators’ top three defenders in Roman Josi, P.K. Subban and Mattias Ekholm. He gave Forsberg the MVP award, who has 24 points in 22 games so far this year. He credited the defense for being the backbone of the team and believes that once Ryan Ellis returns from offseason knee surgery in the next few weeks, the team’s defense will be hard to beat. Amongst other notable grades, the scribe hands an incomplete to Nick Bonino who has been hurt for much of the season and hasn’t shown much so far and also hands a below average grade to youngster Pontus Aberg, who many thought could have a breakout year. Instead, he has been a repeated healthy scratch and hasn’t scored a goal yet in 12 games. Lyle Richardson of The Hockey News writes that while Vancouver Canucks defenseman Erik Gudbranson has been mentioned in trade rumors often, it might be just as equally possible the Canucks bring him back next year. Gudbranson, who is eligible for unrestricted free agency at the end of the season, could be a quality rental candidate with teams such as Toronto and Florida as possible trade targets. However, Richardson writes that Gudbranson loves playing in the team’s up-tempo style of play, is well liked by Vancouver brass and has shown an interest in re-signing with the Canucks. The real question is whether Vancouver would want to pay his rumored $5-6MM price tag. Vegas Golden Knights winger David Perron, who is not playing in tonight’s game against the Arizona Coyotes, did not accompany the team on the road trip down to Phoenix, according to Las Vegas Review-Journal’s Steve Carp. He is receiving treatment on his upper-body injury and remains day-to-day. As TSN’s Darren Dreger artfully puts it, “things get complicated when big trades don’t go down.” It’s a rare occurrence in hockey that substantial details regarding a would-be deal are leaked, but such was the case yesterday. Late last night, Dreger reported that a massive three-team deal between the Colorado Avalanche, Ottawa Senators, and Nashville Predators had fallen through. Now, as Dreger says, teams are in “damage control” today as they try to clean up the mess that a rumored trade of this magnitude. The specifics of the deal are allegedly this: Matt Duchene, the topic of trade rumors for the last year, would have gone to Ottawa. Kyle Turris, who the Senators have struggled to re-sign to their perceived fair value before he hits free agency this summer, would have gone to Nashville (probably with some additional considerations). Presumably, the bulk of the return headed to Colorado would then have come from the Predators. Some are speculating that one of Nashville’s “big four”, Mattias Ekholm, may have been involved in the deal, but considering that Avalanche GM Joe Sakic was the one who reportedly nixed the deal, unhappy with his return, it seems unlikely that Ekholm was part of the final offer. So what now? It’s long been known that a) Duchene does not want to be in Colorado and is likely to be moved eventually and b) that Senators GM Pierre Dorion has taken a liking to Duchene and has been working to acquire him since this summer. Even without Nashville as part of the deal, this is a trade that can get done with a meeting of the minds. Ottawa has intriguing prospects like Thomas Chabot, Logan Brown, Colin White, and Filip Chlapik that have to interest a rebuilding Colorado squad, while roster players like Cody Ceci and Jean-Gabriel Pageau will inevitably enter the conversation as well. In the meantime though, these trade rumors will make the prospect of re-signing Turris at all, never mind below market value, a tough task for Dorion. Duchene deal or not, Turris’ days seem numbered in Ottawa. The New York Rangers’s offense has lived on their power play and their top line of Mika Zibanejad, Chris Kreider and Pavel Buchnevich. They have dominated the early season on offense, while the rest of the team is quiet. However, after a 4-2 victory over the Nashville Predators today, it’s quite obvious that a new line is starting to step in Kevin Hayes, Jesper Fast and Jimmy Vesey. The trio haven’t been together too long as Fast has only been back from injury for the last four games. However, they seem to have a connection, according to Steve Zipay of Newsday. Hayes, who scored the game-winner today, has had three goals and an assist in the last five games. Vesey recently picked up his first goal and assist of the season, while Fast scored the first goal in today’s game and has a goal and an assist in four games. Adam Vingan of the Tennessean writes that Mattias Ekholm has really established himself as the leader on defense. Already on a defense with many big names like P.K. Subban, Roman Josi and Ryan Ellis, it’s Ekholm who leads the team in even strength ice time at 19:03, which is 75 seconds more than any other player on the team. Combined with special teams play, Ekholm is currently averaging 25:52 of total ice time and after scoring a goal today, has one goal and two assists so far this year. Vingan writes that with more responsibility ever since the team traded away Seth Jones and now an injury to Ellis, Ekholm has thrived. Kurt Rohrbeck of The Athletic (subscription required) writes that for the second straight game, Philadelphia Flyers defenseman Travis Sanheim is getting minutes equal to that of a top-four defenseman. Rohrbeck writes that Sanheim’s performance was a mixed bag. Sanheim, who sat out as a healthy scratch often in the first few games of the season, often struggled in the defensive zone, as the scribe points to a moment in the first period in which he allowed Edmonton’s Brad Malone to steal the puck from him and almost score. However, the scribe writes the 21-year-old made up for those rookie mistakes by showing quite a bit of offensive skill, getting off two legitimate shots that could have been scoring chances.